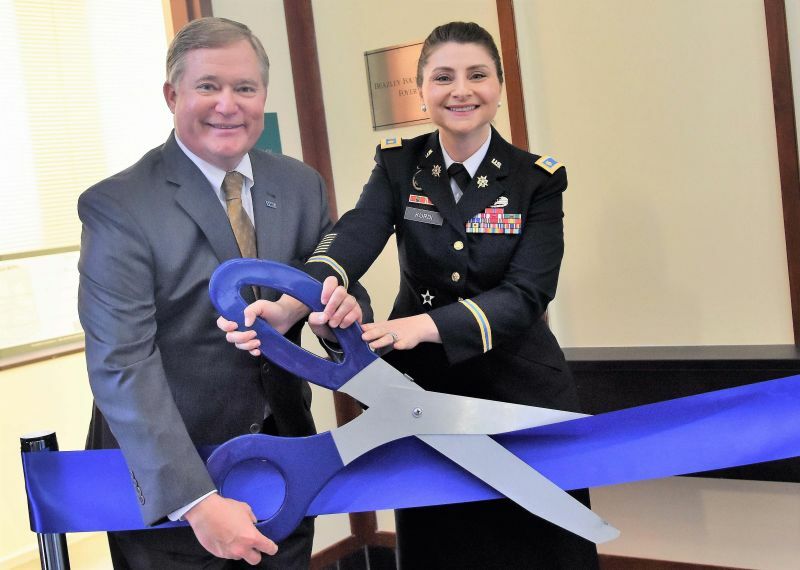 A formal ribbon cutting ceremony was held on February 7 signifying the official opening of the on-campus office for Virginia Wesleyan University’s Army Reserve Officers’ Training Corps (ROTC) program. The Godwin Hall headquarters will serve as a central location for information regarding the Army ROTC Marlin Company. 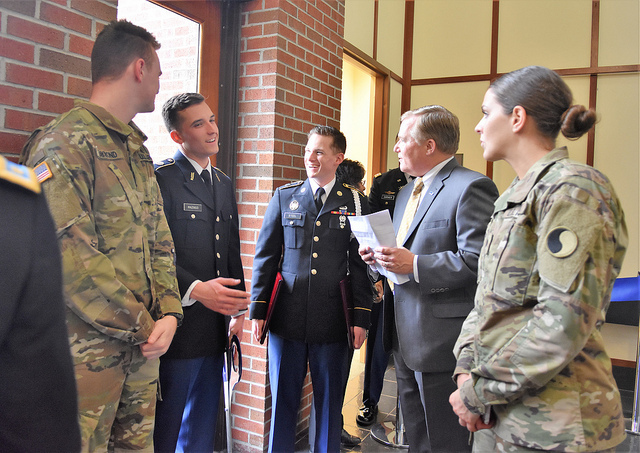 VWU President Scott D. Miller welcomed guests and members of the Army ROTC leadership, including Bob Clark, Director of Military Activities Liaison and Special Projects, and Major Rhana Kurdi, Professor of Military Science. Major Kurdi addressed the room, praising Virginia Wesleyan’s personal approach to learning and its mission to build meaningful lives through engagement in the region, the nation, and the world. The Marlin Company, previously the Marlin Detachment, was formalized on campus in February 1998 and operates as part of Old Dominion University’s Monarch Battalion. Through elective classes and field training, students receive valuable tools, training, and leadership experiences that may not only lead to military service but also become assets in any career field. Since its inception, Virginia Wesleyan has commissioned 20 officers as second lieutenants in the United States Army. VWU’s Army ROTC office is conveniently located across from the University’s Financial Aid and Veterans Affairs offices. In addition to other merit- and need-based scholarships, ROTC students have access to a grant of $1,000 that may be applied to tuition during their freshman and sophomore years. Interested cadets should contact the Army ROTC Marlin Company office at armyrotc@vwu.edu or 757.233.8870, or VWU ROTC Advisor Amy Rush at arush@vwu.edu or 757.455.3401.